universal error published my short story 'love in the club.' Much thanks and gratitude to the editor Chelsea Martin + UE. 'love in the club' is a revision of my short story '1582 love in the club' that appears in Crispin Best's for every year here. The revision/alternate version is a story from my forthcoming collection YOU PRIVATE PERSON | Scrambler Books (2012). 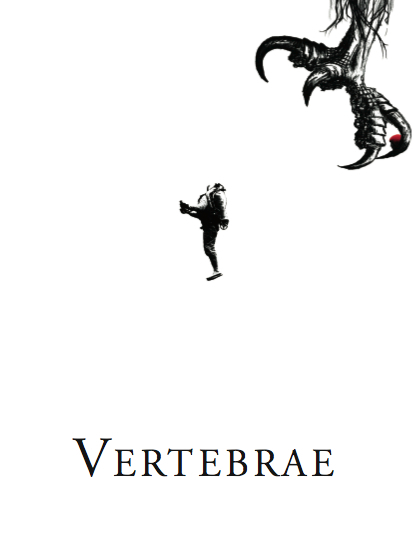 VERTEBRAE Journal issue one is now available through Powell's Books here. VERTEBRAE Journal is edited by me, Jesus Castillo + Cosmo Spinosa. Copies are also available at Elliott Bay Book Company in Seattle, Green Apple Books in San Francisco, and Adams Avenue Books + Warwick's in San Diego. If you are a contributor and still have not received your copy, please contact me (rchiem9@gmail.com) but know copies are on their way. If you would like a review copy or would like to buy or carry VERTEBRAE, please contact me (rchiem9@gmail.com) and we will work something out. Copies are limited. 1 // Meggie Green/funyeah models a quote of mine for a photograph here. 2 // Jimmy Chen includes me in the 'safe zone/well adjusted' circle in his 'Internet persona afflictions' graph here. 3 // Megan Boyle draws me + Frances Dinger in Madrid here. 4 // Michael Inscoe graffitis 'Richard Chiem > Kayne' here. 5 // Fiction Daily posted a line from my short story 'we are a goldmine' here. 6 // Frank Hinton makes a collage of her favorite writers here. 7 // elalmeria re an anthology of 'new wave american poets' entitled 'vomit,' edited by Luna Miguel here. 8 // excerpt by Ben Lerner from Leaving The Atocha Station on Muumuu House here. 9 // Dennis Cooper re Tina Aumont & Delphine Seyrig Days here.